Welcome to Paradise! Ocean Pointe is one of the finest resorts in Tavernier, Florida Keys. Our unit offers spectacular views of the beautiful marina and wide open Atlantic. Just a couple of steps from the clubhouse where you can enjoy breakfast or lunch , or perhaps have an afternoon cocktail as you watch the boats come in with their “catch of the day”. The resort offers a quiet beach area with lounge chairs, umbrellas, BBQ area and beachside volleyball. Get your game on at our poolside tennis courts, or simply sip on a cool drink from the Mermaid Bar while you soak up the sun at our newly refurbished pool/hot tub deck. Boater? Our beautiful marina has a boat ramp with capacity for up to a 28' vessel. The Keys have some of the world’s most beautiful reefs. Dive John Pennekamp, Hens and Chickens, Molasses Reef and many more! Keys fishing is world renowned. You can enjoy deep sea, reef, flats, spear fishing or simply cast a line from our pier. Of course, you can just jump on a boat and head out to the sandbars or any of the many enticing restaurants on the bay or ocean side, tie up to the dock and enjoy your breakfast, lunch or dinner. The condo's proximity to the marina, beach, cafe and pool makes it the most desirable building at Ocean Pointe. Building5 or "Swordfish". Our unit features two beautifully furnished bedrooms with queen beds. The master bedroom and living room have a balconies with marina/ocean view. Kitchen is fully equipped to handle any of your cooking needs with counter top seating, washer/dryer also located inside the unit for your convenience. The resort is centrally located and close to a wide variety of enticing restaurants, movie theater, full shopping center, fishing charter locations…everything you need is conveniently within reach! You can bring your boat, you need reservations for boat slips, reserve early!! Our family is from Miami, and we've been coming to the Keys to 'get away' for the past 16 years. We like to think of it as our 'home away from home'. We feel like we're in another world as soon as we drive in! Our kids have grown up here and it is the one place where we feel we can truly 'disconnect'. Ocean Pointe is quiet, but also offers activities for the whole family. We love hopping on our boat and grabbing lunch nearby, or barbequing downstairs with friends or family. Our property is far enough to feel like you've left the "hustle and bustle", yet close enough to all the conveniences you may need. Beautiful views, nearby sandbar, fishing, diving. 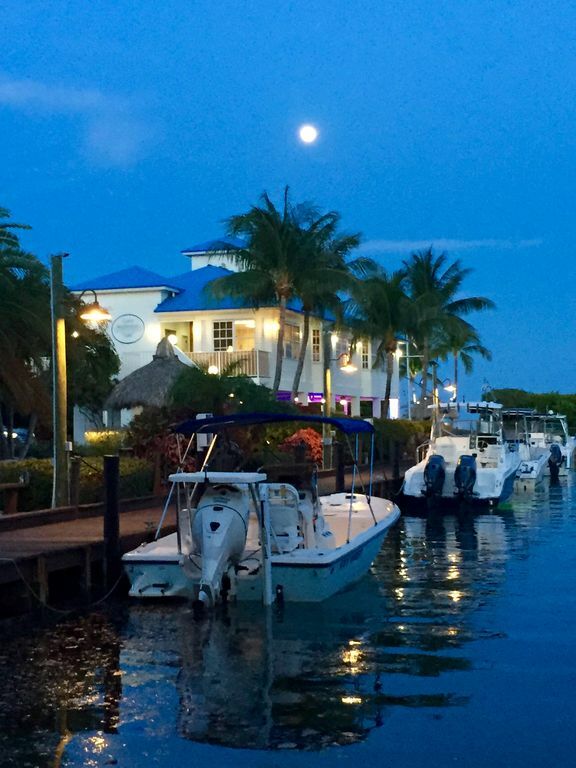 Local restaurants feature the best of Keys dining. A day trip to Key West is just 93 miles away, full of scenic views and interesting stops along the way. For Ocean Pointe guests only. We enjoyed this location, close to great fishing and restaurants. Very secure with a guard shack, Large pool. From start to finish we had a perfect stay in the Pola’s condo. Everything was just as we expected, equipment and the decor were comfortable. The rooms were immaculate and well-furnished. The pool was convenient and the weather was perfect for vacation. We have no hesitancy recommending this condo highly. Our stay was wonderful. Our condo was neat, clean and very comfortable and included everything we needed. And the location was right next to the pool, the water and on-site bar and restaurant. Everything met or exceeded our expectations. The owner was very attentive and promptly responded to all of our questions. Any future trip to the Keys will be to this location. Thanks for a great week! This Condo was perfect! Fantastic amenities, locatio and, views! All spectacular!! We found the best location and the perfect Condo. Thanks Jorge for letting us be your guest. We loved our stay here!! See you next year!! Our family of 5 loved our recent stay. Jorge’s OceanPointe condo was really perfect. The decorations, linens, bathrooms and kitchen made us feel like we were really on a luxury vacation. The kitchen had everything we needed (toaster, blender, glasses, dishes, silverware, coffeemaker, etc...) and the view from the two decks was amazing. We also enjoyed the pool, hot tub, tennis courts and beachfront. This location was perfect for our day trips to KeyWest, Marathon, Key Largo and the Everglades National Park. Thank you Jorge for sharing your place which was a great value for a family of 5 compared to area hotel rates and so much extra space and amenities.